Reflecting the varied hues of tradition and culture and its pomp and splendor along with faith in the hearts of people, the echoing of ‘Jai Bhagwati Nanda’ in the hills, marks the religious gala of the Nanda Devi Festival. 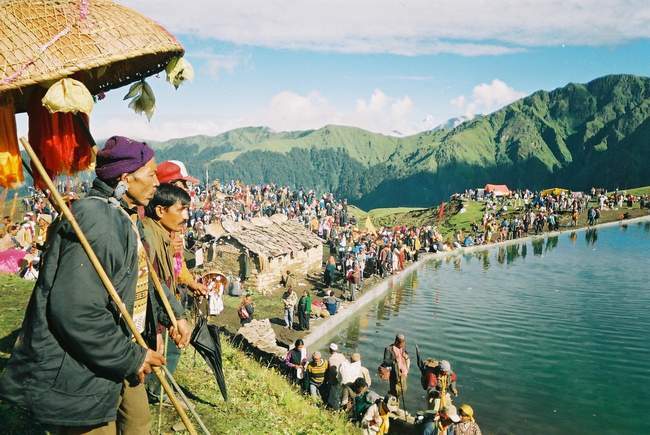 The Raj Jat Yatra of Nanda Devi started from the village Nauti in Chamoli Garhwal on August 29 and after completion of the pilgrimage, the Yatra returned to Nauti on September 16. The sacred journey covered a distance of around 280 km and stopped at 19 stations. It reached Hom Kund, the final destination at a height of 15000 feet on September 13 on the Ashtami of Bhadra Pad Shukla. Puja was offered there in the morning to Goddess Nanda, after which the four horned ram was anointed and released to carry on its heavenly journey to the higher reaches of the Himalayan region. After the ram was released, no one is supposed to look in its direction and concomitantly the procession started its returned journey. Nanda Devi is the patronising the goddess of Uttarakhand and several shrines are devoted to her all across the state. Every year, the Chhoti Raj Jat is celebrated; it starts from the village Wan and terminated at Bedni Buyyal in Chamoli Garhwal. It is local affair and then it is transformed into a huge pilgrimage once every 12 years when a four horned ram or Chausinghia Khadu is born, which leads the procession. The festival is famous Kumbh of the central Himalaya in which pilgrims from different parts of the country participate. The Nanda Raj Jat offeres an unparalleled and complete experience to the pilgrims with interest in local culture as well as to those who are passionate trekkers. It is an arduous journey in the wilderness but is imbued with the endemic flora and fauna of Garhwal Himalaya. Its scenic beauty and the ethic life style of the people that is displayed there. The journey embraces one of the most beautiful Alpine meadow, Bedni, and the glacier lakes of Bedni and roopkund. On August 29 the yatra started as decided. The day was selected because the pilgrims of the Raj Jat had to reach Kulshali on amavasya, which was on September 5, and offer puja to Goddess Kali on the auspicious day. The pilgrims were accompanied with dolis (palanquins) nishans (symbols) and chatolis (sacred umbrellas), which symbolise the supreme power of the Goddess Nanda. There is organizing committee that run this yatra and helps the pilgrims in the high altitude areas during the last let of the journey with food, medicine and other essential items. 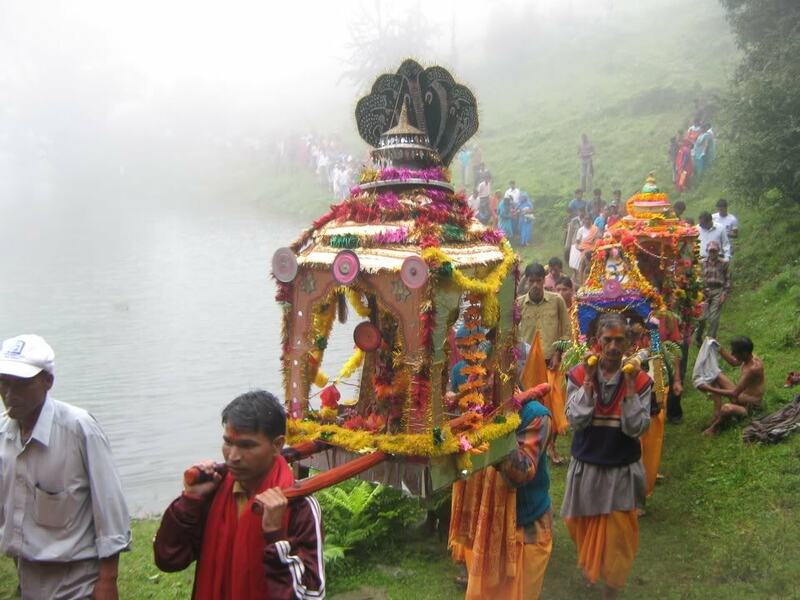 The yatra was initiated by Raja Kanak Pal of Chandpur Garhi from Nauti in 688 AD and was popularised throughout Garhwal by his scion Raja Ajay Pal who consolidated and the 52 principalities of Garhwal into one kingdom. In Kumaon, the worship of Goddess Nanda was started by Raja Baz Bahadur Chand in the 17th Century. Nanda is the primordial cosmic energy which dispels the darkness of ignorance from her devotees.